Master Teruyuki Okazaki, Chairman and Chief Instructor of the International Shotokan Karate Federation, is revered as one of the greatest karate masters of our time. At 75 years of age, he moves with the speed and grace of an athletic man in his twenties. He smiles broadly and laughs easily, defying the somber stereotype of a martial arts master. His warmth, humility, and understanding of the human condition are obvious to all who encounter him. &quot;Karate practitioners and other martial artists must know that the martial arts are about more than physical development, self-defense, and competition; most importantly, they are about continually striving to perfect one's character,&#x201d; Master Okazaki explains. This is the message that Master Okazaki's own teacher, Master Gichin Funakoshi, the father of modern karate, most wanted to emphasize as well. To this end, Master Funakoshi articulated two sets of principles, the Dojo Kun, and the Niju Kun. The Dojo Kun are the five guiding, general principles of karate; and the Niju Kun are the twenty specific and subordinate principles of karate, which encompass morality, technique, and proper mindset. 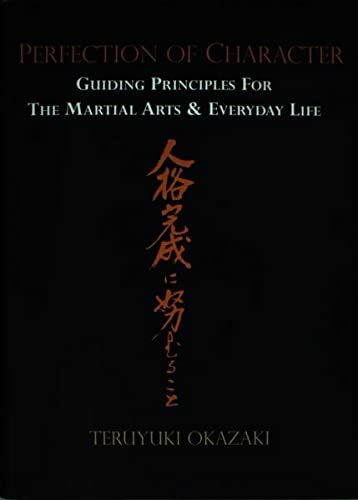 In this book, Master Okazaki draws out the deep and hidden wisdom from these seemingly simple principles in a light and lucid fashion, and emphasizes that the principles of karate are principles for living a peaceful, fulfilling, and happy life. This profound book is not just for karate practitioners and martial artists; it is a book for all who genuinely seek to become the best person they can be. Master Teruyuki Okazaki was born in 1931 in Fukuoka Prefecture Japan, to parents of the Samurai class. Throughout his childhood, he studied judo and kendo. He began studying aikido and karate when he entered Takushoku University at age 16. It was there that he studied karate with Master Gichin Funakoshi, the father of modern karate, and with Master Masatoshi Nakayama, Master Funakoshi's first assistant and co-founder of the Japan Karate Association (Chief Instructor JKA, 1955-1987). Master Okazaki graduated in 1953 with a degree in economics, and subsequently became the coach of the university's karate team. Master Okazaki traveled extensively with Masters Funakoshi and Nakayama, teaching and demonstrating karate to help promote and build the JKA. In addition to his teaching and coaching responsibilities, Master Okazaki helped develop the JKA's first instructor training program. In 1961, Master Okazaki came to the United States on a six-month teaching assignment in Philadelphia, Pennsylvania. He ultimately made Philadelphia his home and has been teaching and training at the same location for more than 40 years. In 1977, he founded the International Shotokan Karate Federation and, as its chairman and chief instructor, has built it into a premier karate organization with over 50,000 members in over 30 countries worldwide. He has attained the highest level ranking in karate as a 9th dan (degree) black belt. He frequently travels throughout the world to teach the technical and philosophical principles of karate to his thousands of students.